SCRs or Silicon Controlled Rectifiers are members of the electronic active component family. They are also called Thyristors. The figure on the left shows the standard electronic symbol of an SCR. It shows the three lead pin outs of the part, the upper one being the anode, the lower one the cathode, and the central extension the gate. The symbol quite resembles an ordinary rectifier diode symbol having an extra lead from the cathode side. Though SCRs are much different from diodes, they too rectify AC in response to DC electrical triggers on their gate inputs. As you can see in the actual picture of an SCR on the right, it looks like a transistor. Externally they may look exactly like transistors, but are entirely different as far as technical specifications are concerned. Both act as switching devices, although SCRs comfortably handle high voltage AC, whereas transistors normally are dedicated for low voltage DC applications. The lead orientation specifies the first lead from the right to be the gate, the extreme left is the cathode, and the center pin is the anode. 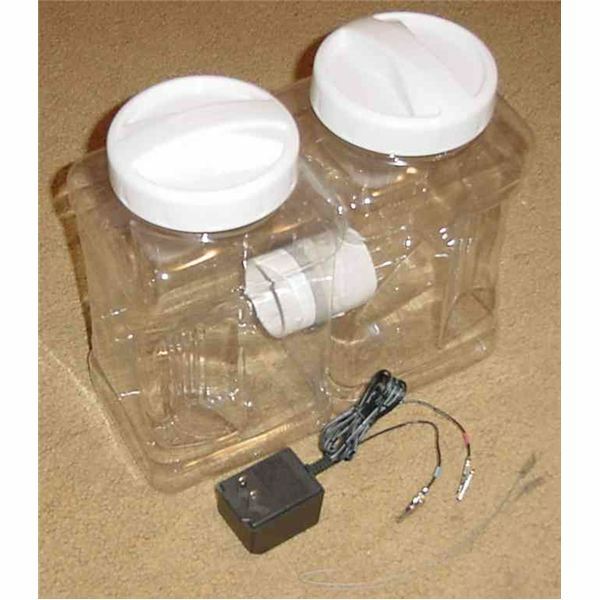 The gate and the anode leads always work with respect to the ground; the cathode lead is specified to be connected with the ground and serves as the common release terminal for the gate as well as the anode. The load that needs to be operated is connected across the AC input and the anode of the SCR. Unlike transistors, which may show an exponentially varying output current pattern, equivalent to the applied input switching current, SCRs have specific triggering levels below which they may not conduct properly. However, once the trigger level crosses the optimal value, an SCR may swing into full conduction. 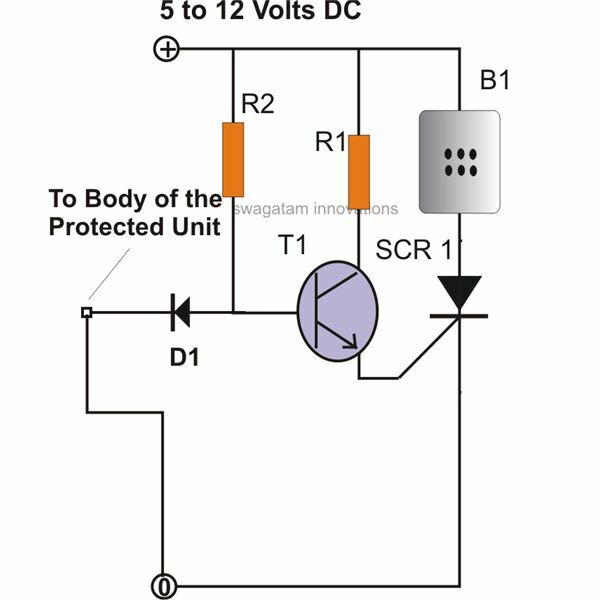 Another typical property associated with SCRs is their “latching" behavior with DC operated loads, where the anode to cathode conduction through the load latches or “holds-on" even after the gate trigger is inhibited. However, with AC operated loads the above drawback, or rather benefit, is not available and the load is switched ON or OFF exactly in response to the switching of the SCR’s gate triggers. 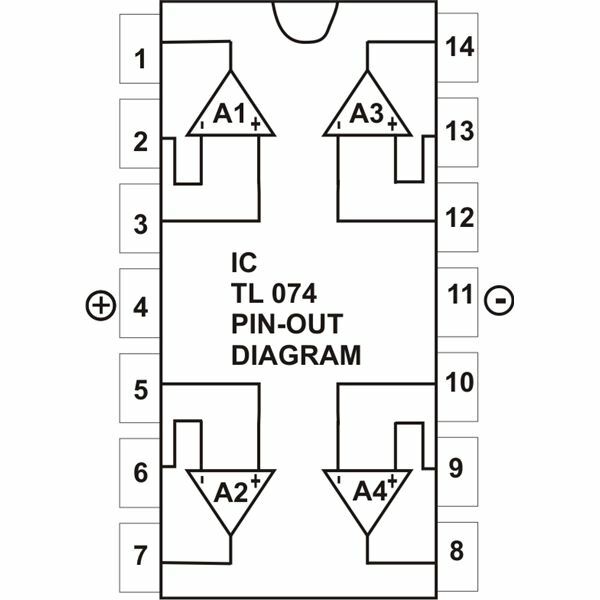 The following few simple SCR circuits are based on the above properties of the device. Let’s learn how the discussed features can be exploited for some useful applications. 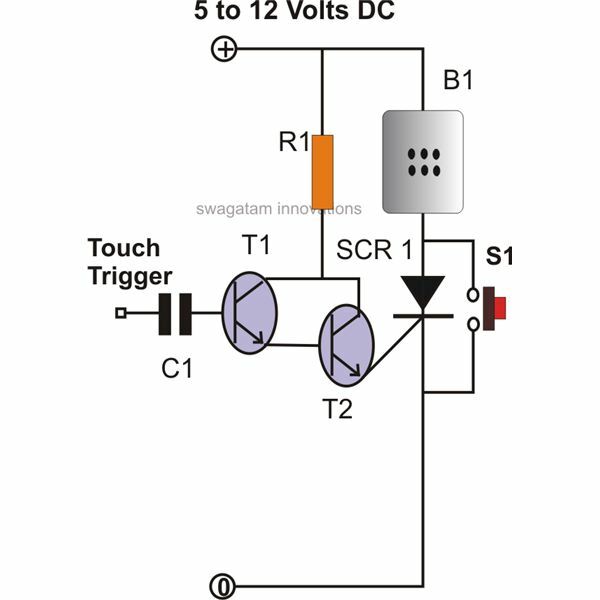 A simple DC operated SCR circuit can be used as a touch trigger operated alarm system. The circuit incorporates two transistors and one SCR as the main active components, touching the capacitor input immediately switches the Darlington transistor pair, which in turn triggers the SCR, sounding the bell. Since the load (bell) is being operated in the DC mode, latches on to ring continuously even after the input touch trigger is removed. The circuit is “unlatched" by pressing the push button S1, just momentarily. The unit may be used in door handles in restricted areas, such that the alarm gets triggered every time the handle is touched by an intruder in an attempt to open the door. SCR1 = C 106 or equivalent. 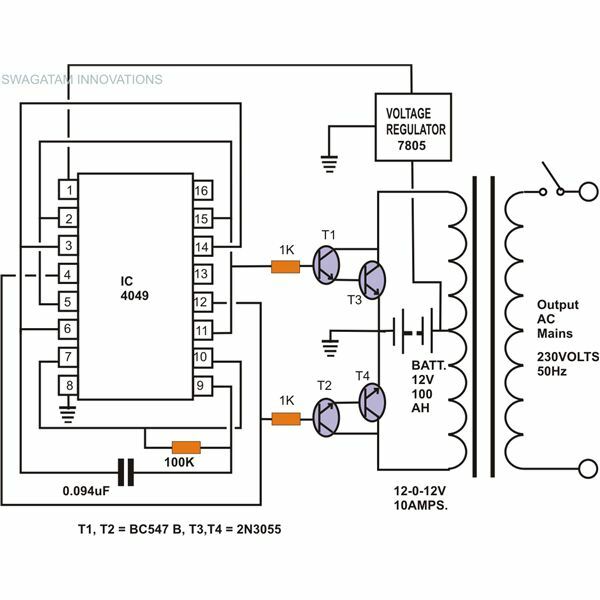 Another similar circuit involving an SCR as the main member can be made for quite a similar purpose, the type of triggering being different from the previous one. Here, the transistor’s base is rendered inactive by tagging it with the ground potential and the tagged joint is attached to the particular gadget’s one of the body fitting screws. 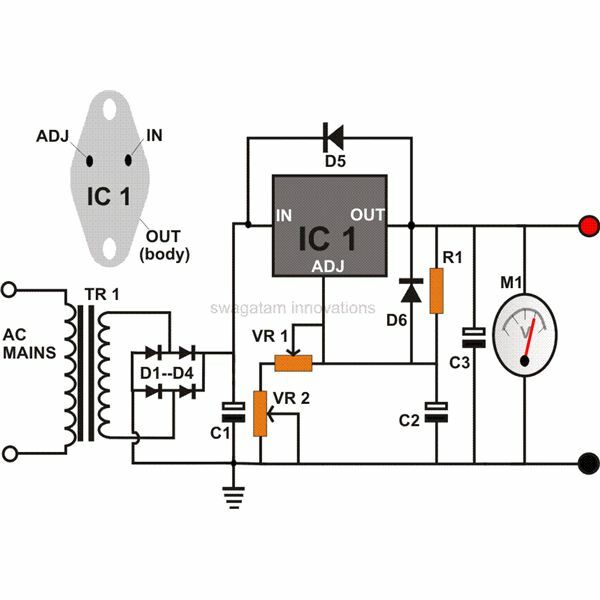 If any attempt is made to steal or remove the unit from its position by disconnecting the wires, it will immediately trigger the transistor and the SCR, sounding the connected alarm. 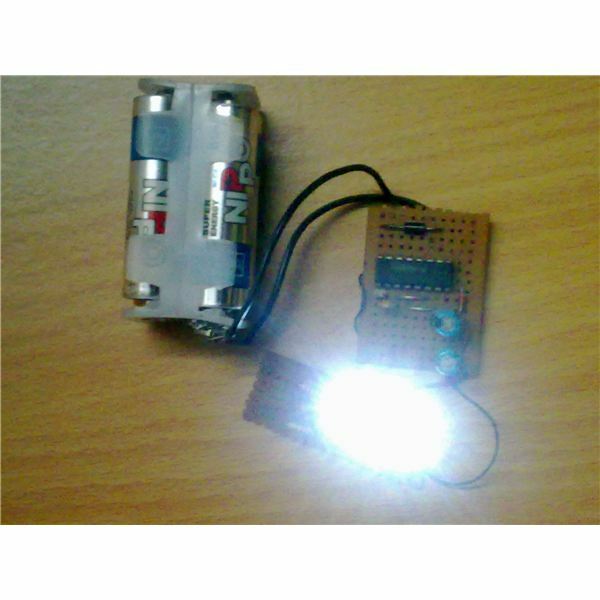 B1 = DC 12V Buzzer. 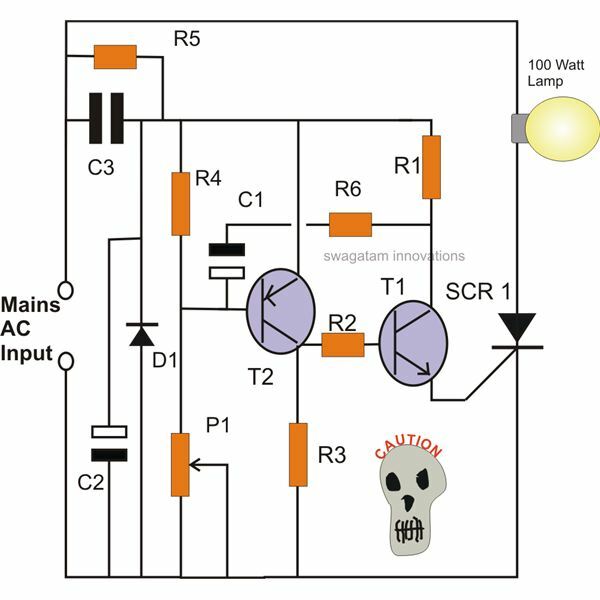 The diagram illustrates how a compact AC operated mains bulb flasher can be made with the help of an SCR. Transistors T1 and T2 along with the other passive components form a regenerative type of oscillator circuit, with C1 and R6 defining the rate of oscillations. P1 also to an extent can be used for altering the oscillation periods, however its actual function is to optimize and sustain the regenerative process in the circuit, which is ideally achieved when P1 is set at around its mid-way region. The DC pulses from the emitter of T1 are applied to the gate of the SCR, which responds by switching the connected bulb to produce the desired flashing effects. The diagram shows a simple SCR circuit configuration, incorporating a Darlington pair transistor for sensing the rising level of water in the tank and an SCR which triggers through the voltage received from the emitter of the above transistor. 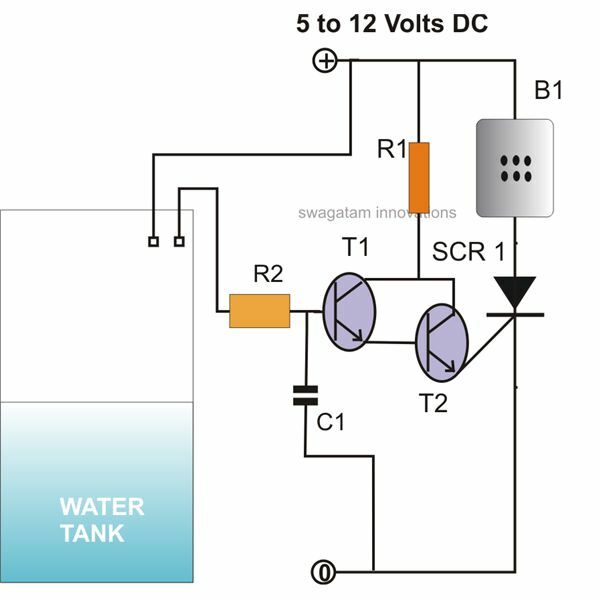 Referring to the diagram, when the water in the tank reaches the overflowing level to touch the set trigger points, T1 gets triggered by the voltage leaking across its base and the positive. The signal received from the emitter of the conducting transistors immediately triggers the SCR and the connected DC buzzer which alarms the whole area of the situation. 3 normally closed switch attached to each door (1 switch for 1 door) in my house, whenever one of the door opens, a Red LED light will turn on and stays on even the door had been re-closed. Same goes with other 2 switch. Reason: I want to build a circuit whereby I could know which door had been open in my house. To avoid an intruder to get into my house. Can U draw me a simple diagram on how can I achieve it? The circuit is integrated to the door switch (normally closed when the door is closed), initially with power switched off. After the connections are made the power is switched ON. 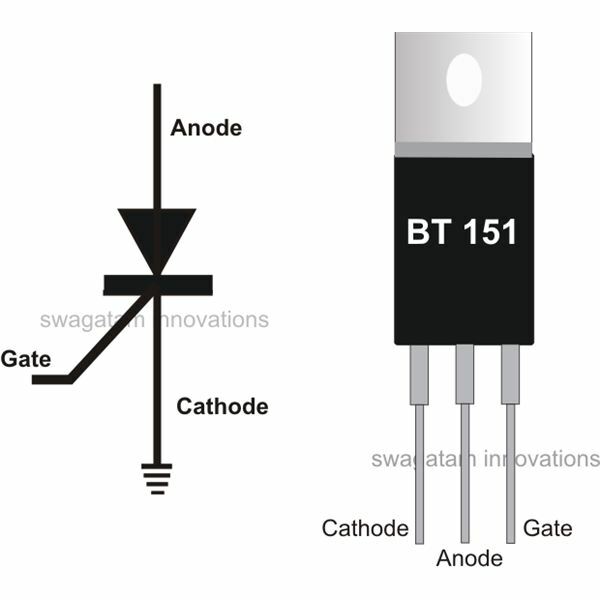 The SCR BT169 remains switched off because the door switch grounds the positive voltage and inhibits it reaching the gate of the SCR. The LED also remains shut off. Now in this position if anybody, possibly an intruder opens the door, the switch also opens, allowing the gate voltage to pass, which switches ON the SCR and the LED. 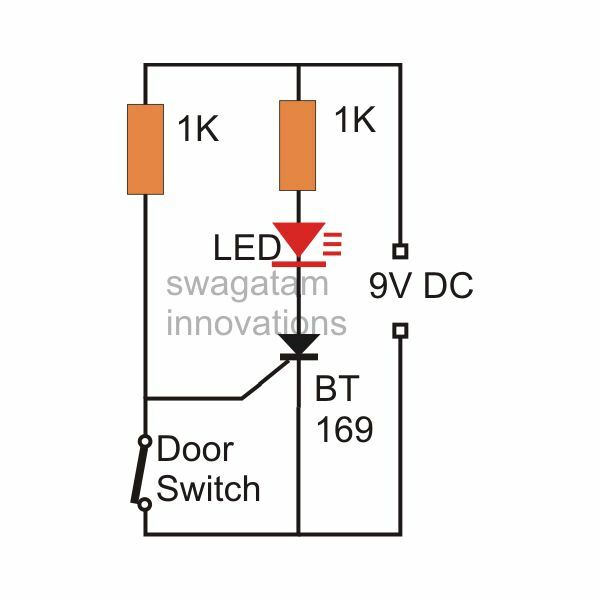 Due to the latching property of the SCR, the LED remains switched ON, irrespective of the door position, no matter how many times it’s closed or opened. 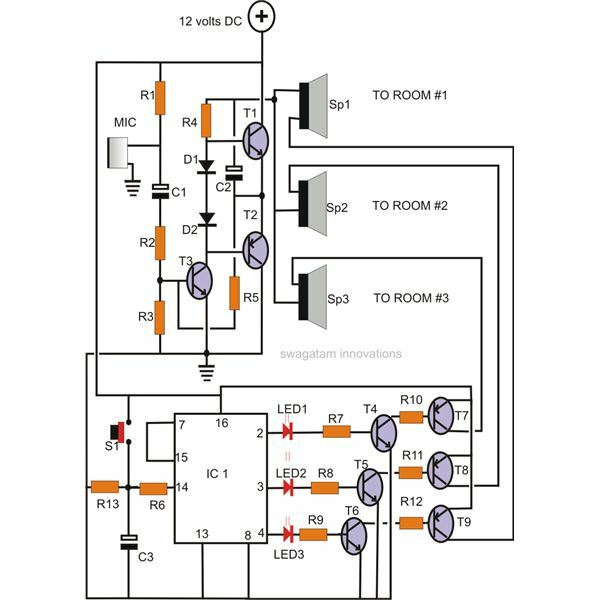 Each door should have one such circuit, but the power can be shared from a single battery.